Speaking for myself but, I think, for many ADPSR members as well, 99 Percent Invisible is a fantastic podcast that highlights fascinating stories in the design world. As always, the recent 99PI story on civil defense against the threat of nuclear weapons was engaging, beautifully produced, and thought-provoking. However, it also missed a significant aspect of the story: Architects / Designers / Planners for Social Responsibility (ADPSR) was founded in 1981 as a response to threat of thermonuclear war. ADPSR spoke out for the design professions expressing the view widespread throughout the country and the world (but largely missing from the story) that the appropriate response to the threat of nuclear weapons (especially, but not exclusively, the larger thermonuclear weapons) was disarmament, a ban on nuclear weapons, and a redirection of war-planning and war funding towards socially responsible development. 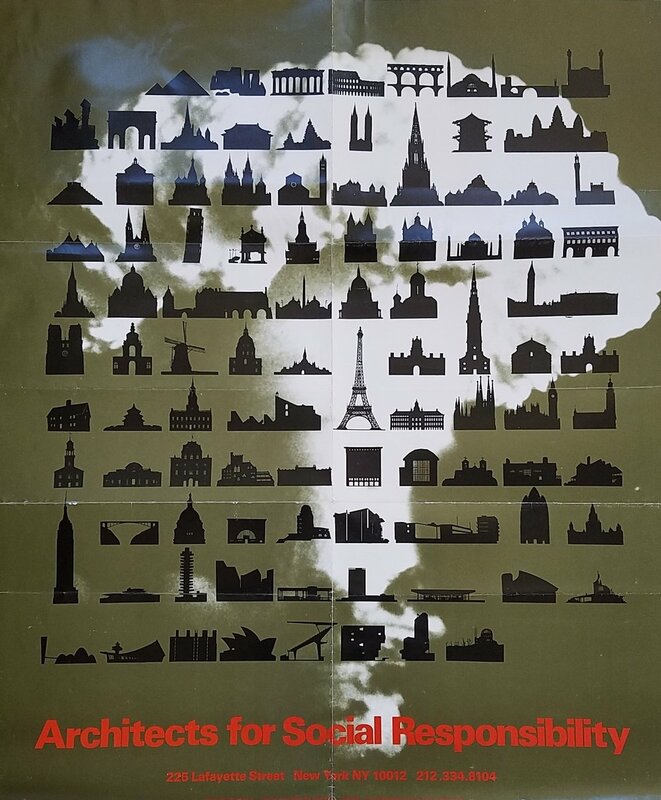 In fact, one of ADPSR's earliest documents was a poster of monuments of world architectural history silhouetted in front of a mushroom cloud. Most of the 99PI story was about the potential utility of civil defense, at least in the face of small bombs like the "Fat Man" bomb or those currently developed by North Korea. We at ADPSR see it differently: as the threat of nuclear weapons turned into the global annihilation promised by H-bombs (as in the movie Wargames, also featured in the story), U.S. authorities promoted civil defense in a way that can only be considered domestic propaganda -- trying to convince Americans that we could fight and win a nuclear exchange with the Soviet Union in order to bolster support for belligerent Cold War policies and a bloated military industrial complex, including enough H-bombs to destroy the world hundreds of times over. ADPSR worked to raise awareness about the danger and injustice of these policies using the tools of guerilla graphics and humor. We held a design competition to mock the concept of bomb shelters, and published the results as the book "Quonset Huts on the River Styx." 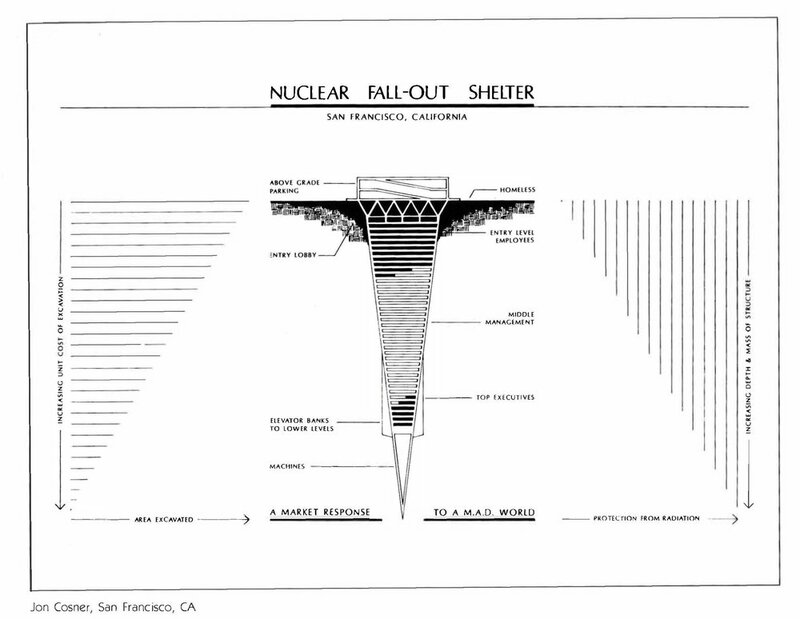 One of my favorite entries, as a Bay Area resident, is an inverted Transamerica pyramid with the floors reserved for increasingly privileged people as it descends further from the fallout zone. 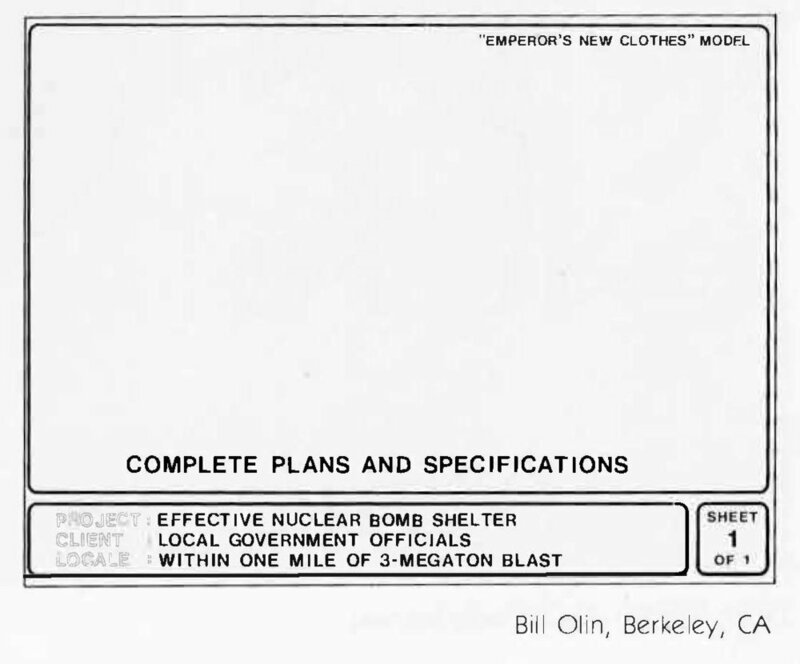 Of course the "Emperor's New Clothes" bomb shelter is also a classic and very much sums up ADPSR’s views on how much good a bomb shelter would really do in a thermonuclear exchange. That wasn’t all. ADPSR members in the 1980s also stamped their architectural drawings "Not Designed to Withstand Nuclear Blast" as they submitted them to local building departments. And there was a famous incident at the AIA Convention in San Francisco when members brought a large paper-mache ICBM into the expo floor; when the AIA convention was in Phoenix, ADPSR members were thrown out for trying to hand out leaflets explaining the nuclear threat to AIA members. 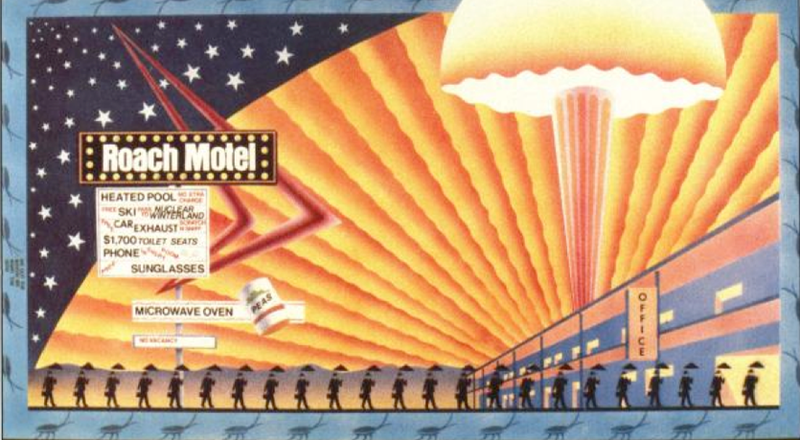 Perhaps most provocatively to the country at large, ADPSR organized a two-way exchange with Soviet architects, hosting a group to come to the United States and sending a delegation to meet with our fellow professionals in the USSR. Through this kind of “citizen diplomacy,” ADPSR members demonstrated that even if our countries’ leaders were belligerent, our citizens preferred to find peaceful means of coexistence and collaboration. This kind of work runs counter to the fearmongering stoked by civil defense. ADPSR later won the AIA's collaborative achievement award for this activism. Returning to the 99PI story, the idea that the new nuclear threat from North Korea might rescue civil defense from its history as a propaganda tool is a bit one-sided. A more reasonable and progressive response to North Korea's nuclearization is represented by the 2017 Nobel Peace Prize award to the International Campaign to Abolish Nuclear Weapons (http://www.icanw.org/action/nobel-peace-prize-2017-2/): if the United States supported global denuclearization (including dismantling our own weapons, as required by the Nuclear Nonproliferation Treaty, which we signed), we would be far more successful in negotiating with other countries to enforce their denuclearization as well. ADPSR’s history is, I hope, a reminder that in the face of belligerence both from leaders abroad and at home, design professionals can work for peace rather than try to prepare for the worst. As Albert Einstein once said, "you cannot simultaneously prevent and prepare for war."